Then there's this logo, the latest type I believe. For sale too. No Mandela Effect just some people not knowing version dates - pink label reached these shores in 1992. 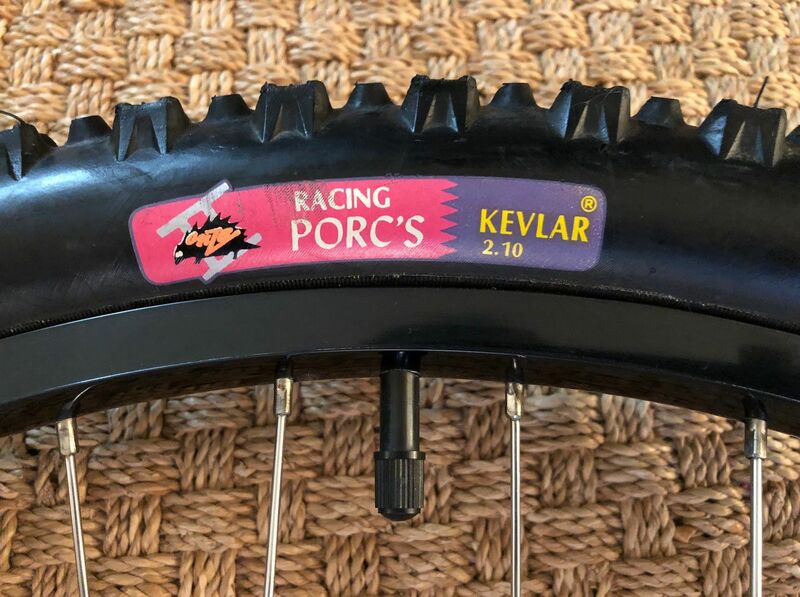 By 1996, as bike pro site makes clear from its pic dates, the pink label 2.10 racing porc IIs already had been discontinued. Porcs II pink label are the 'nicer' i.e. better ones, and are the ones to have for any riding or even displaying. The tan-wall version of the Porcs IIs (pink label) and the Kevlar model (pink & purple label) arethe most valuable and most sought after today.Black-wall versions of both types are somehow completely unloved by all bar the most discerning retro heads (such as myself!). The originals probably all fell apart or, if they still exist, have turned into plastic and will disintegrate at the slightest threat of being mounted to a rim, or dismounted if already fitted. 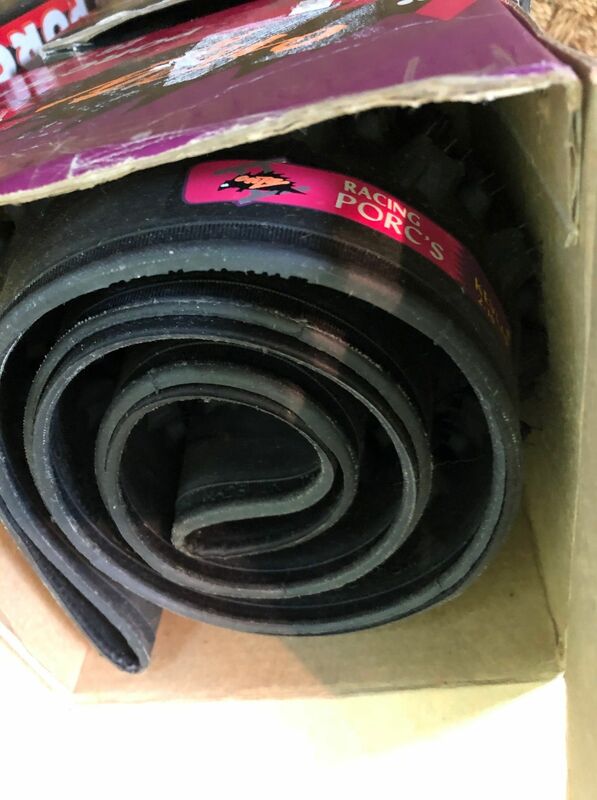 We've established now the pink labelled tyre were available few years earlier.. than first thought , i was correct in saying someone would be along shortly with correct info.. 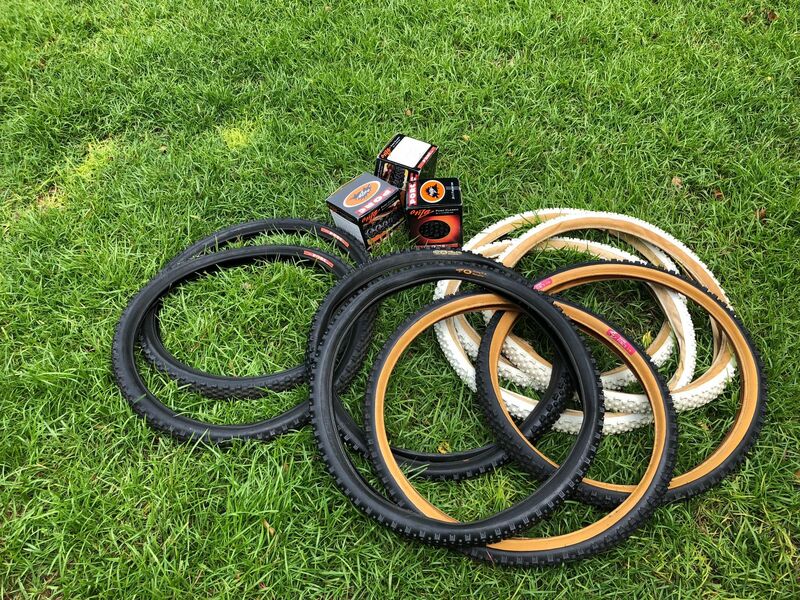 The reason their's not many whitewall and gumwalls available is their more desirable and most likely already in people collections.. hence the prices they sell for..
Come on look at that Onza ad go back to 1992 what tyres would you really pick ? what tyres would you really pick ? Well I never bought white porcs BITD cos I thought they looked shite and I still wouldn’t now, even if I could find some worth buying and able to afford the retro tax now, I don’t have a garage queen worthy, but I have bought a pair of nos pink label tan wall black porcs, a pair of nos big porcupine labels, a nos Classic 1.90 that I just sold and another nos black wall porcs II Kevlar, so, which do you think I’d pick? I wouldn't buy white Porcs either, now,but then went thought many pairs bitd, as many folk did.. 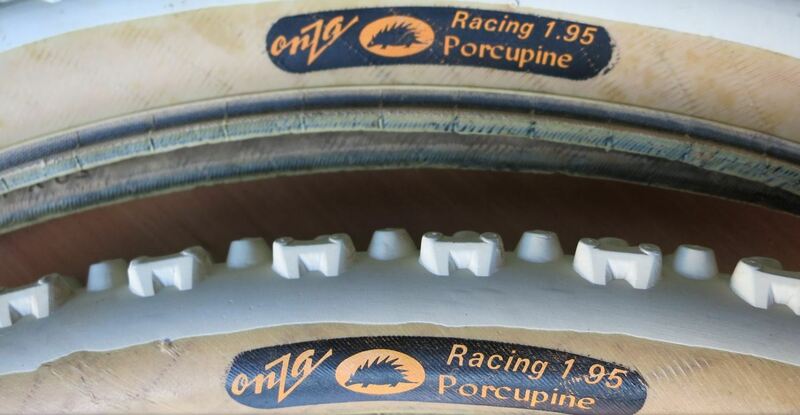 I'm not ashamed to say i forgot the Onza pink Racing porc label even existed that's why i asked Tricky are these reissues. I only remembered i owned a Peugeot Sitting Bull a few days ago . many years have passed since 86 & almost as many bangs on the head. I vaguely remember some pink racing Porcs on a pals Nishiki Alien its a faint memory .. I like to keep a little pork fat around for a rainy day.